The Honor 3C has officially launched in the UK for the bargain basement price of £109.99 - not bad considering this handset is rocking a 5-inch 720p display. This is the second handset from the new Huawei sub-brand, following on from the flagship Honor 6. You also get an 8MP rear camera and 5MP front snapper, which are almost unheard of at this end of the market, and they may see the Honor 3C appeal to those wanting a cheap handset which can double as a capable camera. The 2300mAh battery is sizable, with a power saving mode too boot, plus there's a surprising amount of power under the hood with a 1.3GHz quad-core processor and 2GB of RAM. There's no 4G connectivity, so you're stuck with 3G, and you only get 8GB of internal storage, but thankfully there's a microSD slot which supports cards up to 32GB in size. 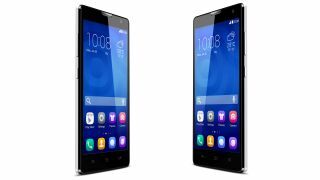 It's not all good news as the Honor 3C runs the ageing Android 4.2 Jelly Bean operating system with Huawei's Emotion UI 2.0. Apart from that small blemish though the 3C looks like a highly attractive smartphone at the bottom end of the market, but we won't know for sure until we've put it through our full review process. The Honor 3C will be available for pre-order on Amazon from today, with the handset expected to ship from November 24.